A royally significant issue - Should Gloucester be a Royal City? Home Carousel	A royally significant issue – Should Gloucester be a Royal City? Is it really a priority? There is currently a consultation from Gloucester City Council that Gloucester should be a Royal city, and why not, why shouldn’t Gloucester aspire to be a Royal city, particularly as it could be used to recognise the significant developments that have come about in the past 15 years, many long in the planning that are coming to fruition, and highlight just what a fantastic city this is and recognise the potential for the future. But, what does it mean, and are there reasons why we shouldn’t do it? Yes there are. On the face of it, getting Royal recognition for the city is a harmless bit of PR, something to shout about which will not mean anything to residents in real terms. It’s not going to cut poverty, homelessness or reduce food bank usage. It’s not going to get the bins collected efficiently or more often and it’s not going to pave the streets in gold. But it will be a talking point, something as a tool to make people see Gloucester in a new light, perhaps an opportunity to bring people together under one banner for the good of the future of the city. In many ways, it is the same as Quedgeley Parish Council renaming itself to Quedgeley Town council. It did not change the form or function of the council, but for a while, it made Quedgeley a focus of attention, and a bit of a talking point when the signs were changing etc. Therefore it is a somewhat hypocritical of those Councillors who vocalised their dissent to Quedgeley changing to a Town Council, but seem to be supporting this move. Gloucester is a city that has a rich tapestry of history, and that is, perhaps where this plan becomes unstuck. Whilst our royal heritage has some notable entries, such as King Henry III being crowned here, Richard II convened parliament here which continued under Henry IV. But we are also famous for the Siege of Gloucester in 1643, where the city defended the Parliamentarian Garrison against the Royal Army of King Charles the 1st. This was significant in the first English Civil war and is still celebrated by Gloucester Day (this Saturday just gone). You could suggest that we are turning our back on that significant piece of history, which in many ways enshrines the drive and determination of people who live in Gloucester, and we should not be doing it for that reason. For me, I think you can have the best of both worlds, I think we do need the PR stunt, to make people look at Gloucester in a new light and really recognise the changes, but perhaps going for Royal status is the wrong tool to do that. You could make a big event out of why we shouldn’t and as the Gloucester History Festival is now on it would be the ideal event to do that. Perhaps the big news piece is making a splash about why we shouldn’t be a royal city based on our heritage. It summary, it is a harmless bit of PR that is profile raising, but I fear it is also a bit of a shallow insult to the history of the city too. And fundamentally, what does it mean in 10 years time (or any period longer that the time to get it) to the residents. But then it is going to cost money to do this application, and there will be visits and schmoozing to be done, in a city council that is already understaffed and struggling to deliver, is this the right priority. Personally I’m on the fence, I don’t think its a priority, but could have value if timed well with other projects, such as Kings Quarter and more city regeneration. But I do think people need to think long and hard about the true value of doing this and how it ties into the strategy of the city to make sure its not just a PR blip but has a decent legacy that people will benefit in years to come. Right now, I don’t see what that is! As a Historian; yes. 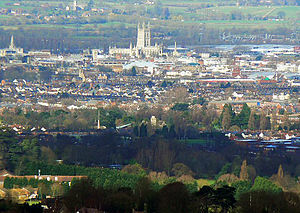 Too long has Gloucester been the poor relation to Cheltenham, but Gloucester has always been much more important, historically, militarily and economically, than Cheltenham, which was just where the knobs went to live and splash about in the waters. I would love to see such an accolade used to raise the image of Gloucester and the aspirations of its denizens. I would also like to see it used to stop the wanton destruction of our historic and vintage building through re-development and deliberately allowing them to decay – or burn down. I also think it would benefit tourism massively. So, and I know that there is indeed going to be a lot of schmoozing and arse licking involved – we have some of the very best arse lickers in our Council Chamber on the Tory side – and there will be costs, I think it’s worth it for the PR and the status and the boost it will bring to our economy. My answer remains the same. When the city council tells me who made the ‘suggestion’, I’ll consider supporting the bid. While they continue to ignore the question, I’m dead set against it. While both our councils continue to strip away our amenities, and can’t even cut back the weeds on our verges, a bid for royal status looks like as much of a joke as was that single panel of cladding they put on a building in Eastgate Street. I wonder, if they call the recycling wagons ‘Royal’, will Amey stop losing my green bin?